To some, recent discussion of the "clean energy race" is just the latest iteration of flashy climate change rhetoric, refurbished and repackaged as a do-or-die clean technology race between the U.S. and Asia. Yet, as a New York Times piece entitled "China Racing Ahead of U.S. in the Drive to Go Solar," testifies, the clean energy challenge is more than just verbal tap dancing, it's a dynamic economic competition - and China is earning its racing stripes. While the U.S. is still floundering with ad-hoc investments in clean energy, China has developed a straight-forward, no-nonsense approach to achieving its 2GW solar capacity target by 2011 and gaining leadership in the solar industry: build market share. With the help of serious government investment, China is on the path to achieving that goal. Chinese companies like, Suntech Power Holdings, have succeeded in driving solar panel price reductions over the last six months by selling panels on the U.S. market below the marginal cost. Furthermore, China is circumventing protectionist legislation by constructing assembly plants in the U.S. According to Steven Chan, Suntech president for global sales and marketing, the first plant will be located in Phoenix, Arizona and will allow China to tap into the portion of the market that wants to "'buy American' and things like that." The catch, however, is that even though the panels will be constructed in America, by Americans, the components will, of course, be made in China. Back in China, governments at all levels, as well as banks, are clamoring to offer solar companies the best in financial assistance: subsidies, free land, cash for R&D, and extremely low interest loans. With so many incentives, entrepreneurs are more than willing to enter the solar market and capitalize on the growing industry. China's quest to increase its solar market share has been further facilitated by the global economic crisis and fewer European solar subsidies. Meanwhile, those same factors have caused German solar giant, Q-Cells, to suffer serious losses. Last week, the company announced a round of massive lay-offs due to plummeting sales directly resulting from the decline in subsidies. While China's strategy is less than wholesome, Suntech and other industry players have managed to cover their bases and behinds. Although selling solar panels below marginal cost could potentially warrant an antidumping suit from the U.S., there is no case as long as First Solar is posting profits and other U.S. solar manufacturers are benefitting from the ARRA tax credits. Just in case, however, Suntech's top executives in the U.S. have deliberately taken on leadership positions in American industry groups to prevent any united opposition to China's solar exports. In light of Larry Summers' recent declaration, as reported by the Financial Times, that United States will no longer "be the world's consumer and importer of last resort" and that "China can no longer behave like China because the U.S intends to," it certainly seems as though China's strategy is not only working, it is enviable. On the other hand, the U.S. appears eons behind its Chinese counterparts in clean energy planning and execution. Obama's energy education program RE-ENERGYSE. would have inspired and empowered tens of thousands of Americans to compete in the clean energy industry but it was dropped from the FY2010 budget. More strikingly, the U.S. seems poised to back away from the strong investments in clean energy industries begun in the American Recovery and Reinvestment Act. 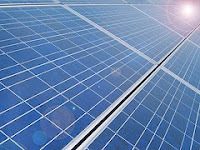 While ARRA invested over $30 billion annually in clean energy technologies, efficiency retrofits and critical modern energy infrastructure, the American Clean Energy and Security Act (ACES), the massive climate and energy bill now winding its way through Congress, would cut investments in the U.S. clean energy economy by 2/3 to just about $10 billion per year. In the context of the solar industry, this lack of a coordinated clean energy strategy is made even more remarkable considering First Solar, a world leader in solar manufacturing, is an American company. Whether the clean energy race is considered rhetoric or economics, the writing is on the wall of solar panels, although it may be written in Chinese if the United States doesn't take action to adopt a long-term, cohesive clean energy strategy.